Pretty seaside morning along the sand dunes. Inspiration for this seaside morning scene is from Fort Lauderdale Beach. Any time of day and night there seems to be people enjoying the Atlantic Ocean views. The morning sun was glistening off the water. The dunes had their variety of green grasses and plants. Just follow the beach path to the sea. 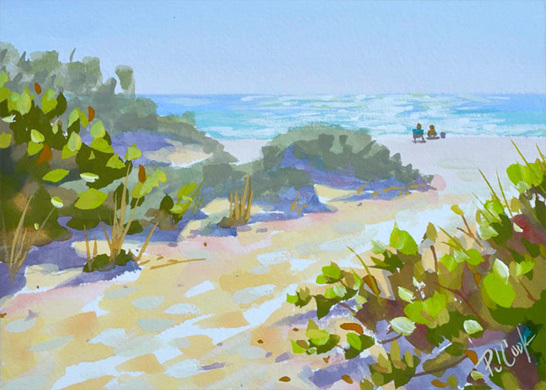 Artist’s Notes: This seaside beach painting is an original work of art by PJ Cook. Original watercolor is 5″ x 7″ size. Professional materials used throughout. Signed by the artist front and back. Free shipping! Will easily fit in a ready-made picture frame. Can be purchased with a quality mat and picture frame, contact for details. Thank you for your interest in my original art and please contact me with any questions.